From 10th January 1945 onwards 'Operation Blackcock' was launched in an effort to bring the Allied line up to the River Roer in the Netherlands on a front of about 12 miles. The leading part was played by the 7th Armoured Division, with the 8th Armoured Brigade and the 155th Brigade of the 52nd Division under its command. 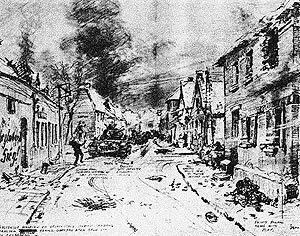 This photo is reproduced with permission of The Illustrated London News and was drawn originally by their War Artist Captain Bryan de Gaineau who was attached to the British Second Army in Holland. The picture was published in 1945 with the title "The Gallant Fight in Susteren". In the picture Corporal Dolly can be seen firing the PIAT from a window of a house, the original caption mentioned "British Infantry established in Susteren holding on desperately against Panzers until supported by advancing British tanks which had been held up at the Vloed Beek crossing". Between January 16th and 20th the 1/5th Queen's attacked the village of Susteren from the west, approaching from Gebroek and across the Vloed Beek. Weather conditions were bad and it was impossible even to get 6-pounder anti-tank guns across the dykes. As the Queen's commenced the crossing of the Beek they came under heavy counter-attack by Spandau teams which were thankfully repulsed although heavy casualities resulted. B Company under Major J E Evans gained a foothold in the northern part of Susteren. Subjected to further counter attacks by the enemy infantry and tanks, the Queen's held on, again with heavy losses. Major Evans was severely wounded. 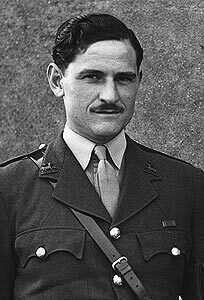 His second-in-command, Captain John Franklyn and all the platoon commanders were killed. Major Evans later had his left arm amputated. Less than forty men of the company survived. Susteren was later liberated but the grateful villagers never forgot the gallant action of The Queen's. In March, Field-Marshal Montgomery held a divisional presentation of medal ribbons for distinctions gained in the "Blackcock" fighting. The share of 1/5th Queen's was the largest in the Division, Major H.J. Nangle receiving a bar to his D.S.O. ; Major C.C. Lilley, Lieutenant M.L. Baker and Second-Lieutenant R. Maxwell, the M.C. ; Lance-Corporal R. Dennis, the D.C.M; and Corporal Dolly, the M.M. The Battalion provided the guard of honour under Captain N.A.H. Marsden, which was accompanied by the Regimental Band, on a visit from England. 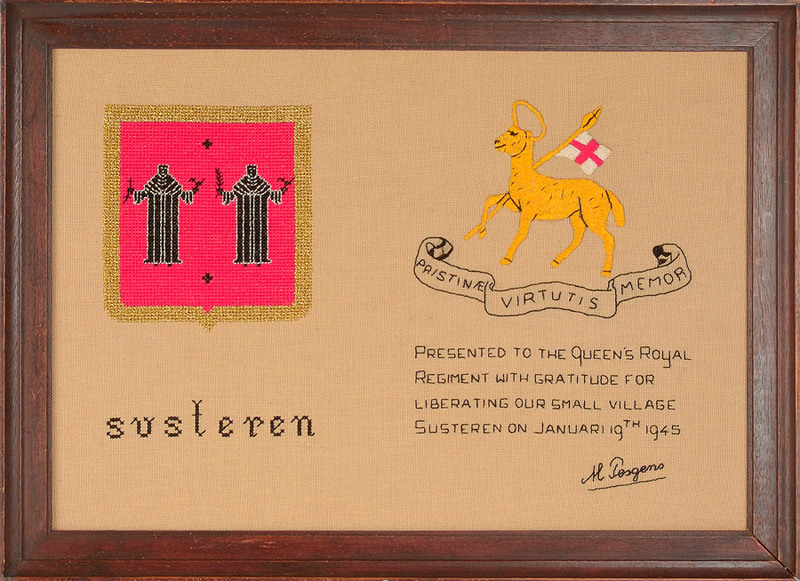 The framed embroidery in the Regimental Museum is itemised as being "presented by the Dutch village of Susteren in gratitude for its liberation by B Coy 1/5th Queen's under Major John Evans DSO after heavy fighting on 17th January 1945". In Susteren itself a school is named R K Basisschool "Major Evans" in recognition of his gallantry and leadership. A touching tribute by the headmaster, staff and children of the school is shown in a letter to Major and Mrs Evans on the occasion of their Diamond Wedding anniversary congratulating them, and covering the forwarding of presents in the form of a drawing of the school and a work of art representing the narrowest part of Holland, the municipality of Susteren, the so called waist. By special request of the "Harmonie St Cecilia" the Headquarters of Army Music at Kneller Hall supplied them with the full musical score of "Braganza". Latest reports showed that the band, 60-70 strong were learning to play it. Forty years after the battle one of the inhabitants wrote a short letter to Major Evans, and it is fitting that this should be the last word on the action. "Thank you for what you and your brave men of B Company did for us 40 years ago. You brought back freedom in our beloved village Susteren. The loss of men in that terrible fight had been enormous. Those men will be on my mind forever because they gave their lives for our liberty."